Raised in racing, the Van Lenning brothers began attending races with their dad at a young age. Their dad always had the dream to race, and their mom did powderpuff racing in the Hobby Stock class. Sonny and Sam also wanted to race, though it was a dream for a long time. Sam started racing Cruisers in 2000 with a friend. His dad was always there making sure the drivers were ready. After their dad died from a brain tumor in 2001, the brothers turned a dream into reality. The two first got involved in racing themselves by driving push trucks at different tracks in the area. Sam was the first push truck driver for the Clay County Fair Speedway. 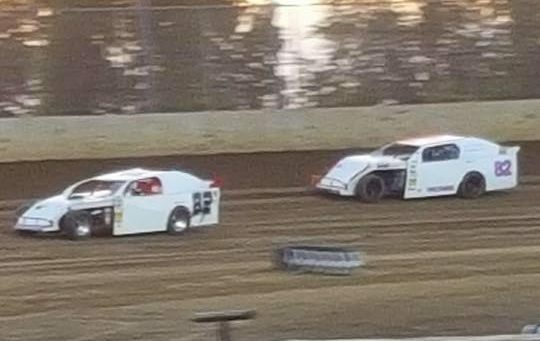 After buying a car last year, Sonny also began his racing career at CCF Speedway. A short time after hearing how much Sam wanted to drive, Sonny convinced his older brother to drive his car one night. From there, Sam was hooked; he bought a car and started racing as well. Racing offers the Van Lenning families the opportunity to get together often. While the risks of the brothers racing always concern their families, they do enjoy supporting Sonny’s and Sam’s dreams on the racetrack. Anywhere the brothers race, friends and family gathers in support; they encourage the brothers’ dreams throughout northwest Iowa and southwest Minnesota. This year, the Van Lennings have a calendar to coordinate the racing schedule. The Van Lenning team has added ribbons for cancer awareness as well as a sticker for Team Tegan with March of Dimes. “A lady who works at our bank knew we raced and asked if we would put that sticker on our car for her daughter,” Sonny said. “We didn’t have to question it; of course we would.” The ribbons, gray and purple, bring awareness to different diseases, as well as the Van Lenning Racing Team’s t-shirts, that have Race for a Cure printed on them. The track conditions at the Clay County Fair Speedway make it Sam’s favorite. Sonny likes the CCF Speedway’s short straight-aways, which help him to get a leg up on the competition. “Sonny doesn’t like it when I pass him,” Sam said. Even though winning is a perk, Sonny also appreciates the great people at the track. “You never know how many people you can meet until you start racing,” he said.